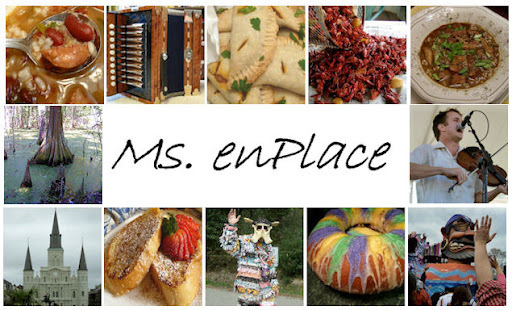 Ms. enPlace: Good Gravy! That’s Rice & Gravy. Good Gravy! That’s Rice & Gravy. Every good Cajun loves a good rice and gravy. Cajun men, in particular, seem to possess a strong envie (craving) for this dish...especially if it is made by their Maw-Maws or Mamas. If you aren’t familiar, rice and gravy also involves meat. No, I don’t know why this isn’t mentioned in the recipe title. 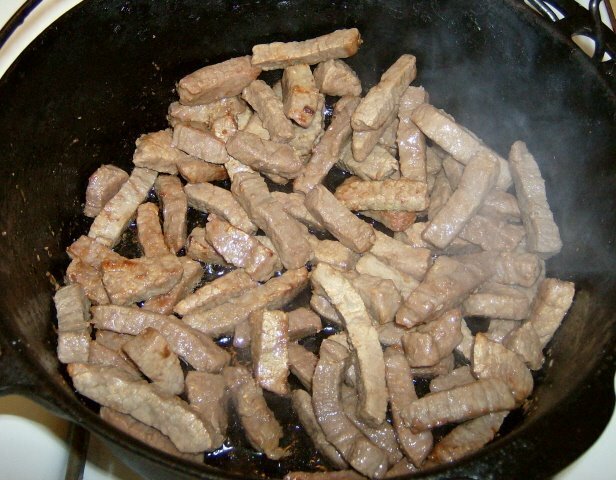 Inexpensive cuts of beef are usually used. Chicken and pork can also be used. My preference is for round steak. 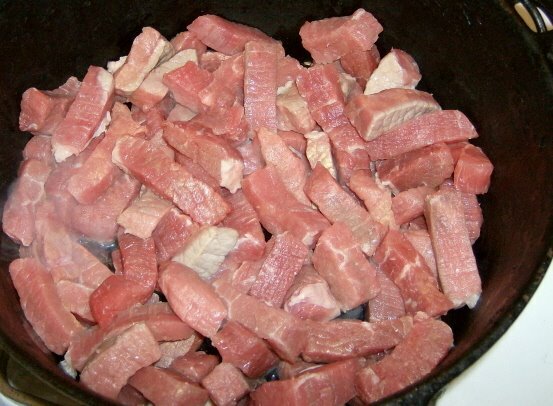 I’ve also used stew meat. My mother in law prefers seven steaks (or seven bone steak). Onions are always present. Bell peppers usually surface. Depending on the cook, garlic and/or celery may be added. Before we get started there are some things you should know. * This is not a fast meal. All this goodness takes time, patience, and love (which is partly why it is so good). * If you try to adapt this to a crock pot I will be very sad. No...I’ll be hot (and not the good kind). I will be angry and fly into a rage. For the love of Pete, don’t do it. It just isn’t the same. Please trust me on this. * As you brown the beef, it will become extremely tough. You will face a moment of doubt. You will curse me and start wondering if everything you read on the internet really isn’t true after all. Look, I wouldn’t steer you wrong, babe (at least not intentionally). Part of the magic of a good rice and gravy is the slow simmering. This will make the meat nice and tender...falling apart. * Do not use a non-stick pot. I repeat...NO non-stick cookware. Again, please just trust me. You’ll want the meat to stick. This is what helps the gravy get dark and lovely. * The more onions you use, the thicker the gravy will be. * The more you brown the meat, the darker your gravy will be. So...ready to move on to the recipe? Ok. Gather up what you need. I’ll wait. If you have a cast iron pot, by all means use it. Do not use a non-stick pot. You’ll be sorry. Chop all vegetables. Cut steak into pieces and season with salt, pepper, and Cajun seasoning. While you are doing this, heat vegetable oil or Crisco (about med-high heat) in the bottom of your non-stick pot (enough to thinly coat the bottom). When oil is hot, add meat. 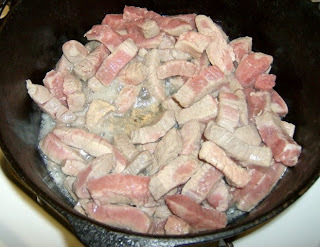 Brown the meat, allowing crust (fond) to form in spots on the bottom of the pot (this is key for a rich, dark gravy). At first, all you will see is your steak boiling in juices. That’s fine. You’ll have to cook off the juices before you get a nice crust on your pan. It will take some time. Really, you are doing fine. Stir while browning the meat. You want brown, but not burnt. Once you've got some crust forming, add a little water (enough to cover the bottom of the pot), scrape the crust with the flat edge of a spatula, and cook down again, evaporating the water. Brown to get crusty spots to form on your pot again, add water, scrape the pot, cook the water away again. Same deal as before. Repeat this process a few times. It will help make your gravy darker in the end. I like to repeat this process about 4 times. No, I’m not crazy. I just like a good, dark gravy. You should too. 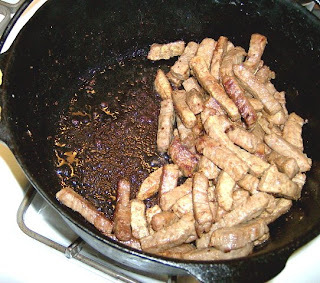 Once the meat is really brown and you are satisfied with the color of the water (more water will be added to your final product, so it should be really dark), evaporate the water away one more time, add chopped onion, bell pepper, and celery if you are using it and cook until they brown up a bit. Toss in some chopped garlic and cook a few minutes. Add enough water to cover the meat and simmer until the meat is tender. This takes a while for certain cuts of meat (sometimes I use stew beef). When I say “a while,” I mean at least an hour. The longer the better. 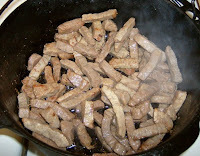 When you are satisfied with the tenderness of the meat, reduce the water to make a thicker gravy. Taste for seasoning and serve over rice. Mais, talk about good! Using round steak today. I've got my oil nice and hot and added the meat...and I'm not using non-stick cookware. Cast iron or stainless steel works really well for this. Notice all the liquid in the bottom of the pot. Totally normal.This will have to cook off before you can get nice crusty spots to form. but we still have a ways to go til good gravy. Now the meat is starting to stick a little, leaving behind lots of beautiful, yummy crusty goodness. This is what will make your gravy nice and dark and provide a deep flavor. Oh, my! No, it's not burnt! It's pretty! I've added some water and started scraping the crust of the bottom. Crust is such an ugly word. The French call it "fond." A Cajun might call it "gremille," which means little bits, scraps, or crumbs left in the bottom of the pan. It's all good. I'll let this water cook off and allow more crusty goodness to form. Add more water. Scrape. Cook water off. Do this about four (4) times. Skipping ahead here, so pay attention! I've gone through the crust-forming steps four times. Then, I've added my chopped onion, bell pepper, etc. and allowed that to brown a little too. Add water to cover everything and simmer for at least an hour, or until meat is tender. So, here it is. All I have to do is cook the rice, let this simmer, and wait for dinner. Ya'll come on over! Finally - a real guide on how to make real Cajun gravy! I was raised by my Cow Island-native mother and grandmother (Momo), in Los Angeles, of all places. I ate the real-deal Cajun food every day of my life in La-La land). Thanks for the wonderful descriptions and photos... and the truly authentic recipes. I actually live in Kaplan now, and can get my Momo to show me how to make rice and gravy now, but I wasn't always that lucky. I tried and tried, had everything right - except the FOUR TIMES RULE - so it always tasted nasty. And regarding Mom's Pepper Steak...my mom served it over creamy mashed potatoes, and side-dished it with some hot, crusty French bread stuffed with cold chunks of butter. It is still my all time favorite comfort meal, hands down. I cannot tell you how much I love that dish. If I went into it, and described my lust for that pepper steak, I'd draw the attention of the men in white coats. Thanks again, and I will be trying out many more of your recipes! Michelle-thanks for you sweet comments. We lived away from LA for about 12 years and it was difficult cooking the foods I grew up with. So many of our traditional foods are learnd visually. I'd call my mom for instructions and her answer was almost always, "do this until it looks right." And then there was the added frustration of not being able to find the right ingredients. Like you, I had to teach myself through trial and error...sometimes lots of errors! I'm actually planning to try this recipe tonight or tomorrow night. I can't wait! I just finished making this. I followed the recipe word for word in my trusty Lodge cast-iron Dutch oven. It turned out perfect! I am waiting for the rice to finish and look forward to eating it very soon! Thanks! Yay! Glad it turned out well. Yum! Would love for you to link this in our Star Recipes Collection (might want to include "Cajun" somehow in your link title!). Thanks for your kind comment about our Beef and Pineapple Vietnamese Rolls. Have a great weekend! Great tutorial!! So hard to find instructions on the true cajun "gravy"!! So glad I found this! I have long been enamored with Cajun dark, brown gravy and wanted to be able to make it for myself some day. Well, oddly enough it wasn't exactly the "Cajun" brown gravy that led me to this tonight. I'm actually wanting to make Chimichanga filling that is as rich and as dark brown as this Cajun recipe. I'd like to substitute some of your ingredients for Mexican ingredients and see what kind of magic happens. Crossing fingers! I'm going to use beef (cooked in the exact manner you described), green chili peppers, onion, garlic, cumin, chili powder, oregano, etc. And then fill some big flower tortillas with the filling and bake it. This is going down tomorrow morning around 10:00 (west coast time). If you have any tips for me before then, please let me know. If not, we'll see what happens! My husband and I were born and raised in WV, and now live in VA, but we are so so fortunate to have dear friends who live in Louisiana (Lafayette to be exact) and we're able to visit a couple of times each year. I'm not exaggerating when I say we are addicted to Cajun food. We've had the gumbo, red beans and rice, etouffee (sp? ), crawfish, fried catfish, boudain balls, etc., but had never even heard of rice and gravy until being at a UL tailgating party. Well I was intrigued - the ladies (young and old) kept describing it and the men just sat there drooling. Being a personal chef, I had to give it a try. I can only say thank goodness for people like you who are kind enough to put this information out there! This is exactly how I made it, plus a few other Cajun spices and oh my goodness - - - words can't even begin to describe. We took pics and texted to our friends in LA - - they declared us to be "Cajuns"!!!!!!! 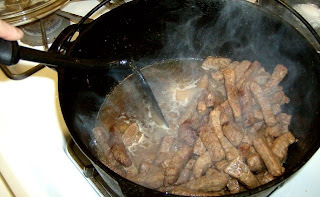 My husband is from a big family of great Cajun cooks, and this is the first recipe that allowed me to duplicate what I think of as REAL Cajun steak and gravy. My family loves it, and it makes me so happy to be able to cook it. Thank you!